When I was living in Seoul, I lived in the neighborhood located in between Sinchon Station (신촌역) and Ewha Station (이대역). Since my school was in that area, I spent a lot of time hanging out in those two neighborhoods and eventually, these areas somewhat became something that feels like home for me during my stay. This time around, I ended up staying at my friend's place in the Ewha side. Even though it's close to my old neighborhood, I never really venture to this part of Ewha. So today I decided to walked around and see if there's anything interesting around here. That's how my walk at Yeonmi-dong (염리동) started (that's the name of the neighborhood btw). Not much going on around here other than hilly roads, a couple of murals here and there, neighborhood shops and residential area. I did stumbled upon two bookstores on my walk. The first one was Chowon Bookstore (초원 서점). 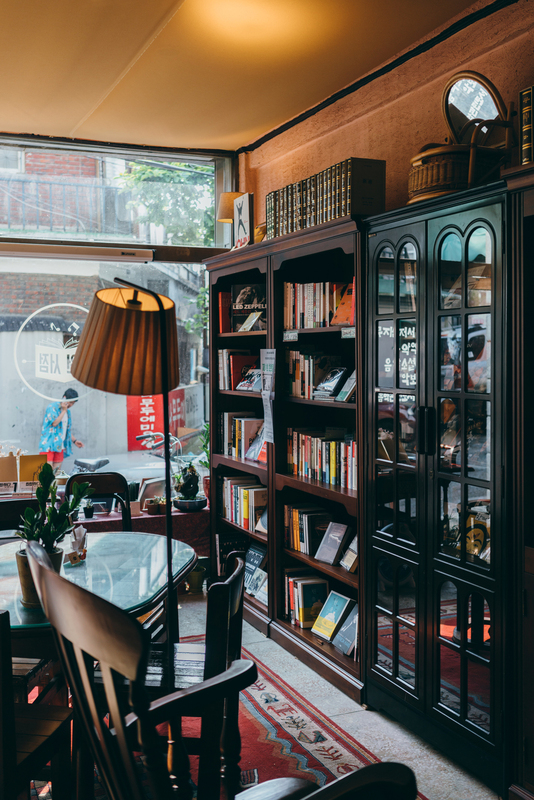 The retro-vibes bookstore is filled with books about music, local and foreign. Even though almost everything is mainly in Korean, it was still pretty fun looking at the nicely designed book covers and the old tapes and vinyl covers that they have in the store. I ended up talking with the friendly guy who was manning the store and found out a couple of random interesting things about the place. The store is owned by the guy's girlfriend. She used to have a dream to open a music bookstore and she finally opened this place 3 months ago. He's helping out around the store and he himself is a full-time bassist for a local rock/disco band and has been playing bass for more than 10 years. They sometimes have guitar lesson sessions in the store and they stamp your book with the purchase date just like a library system when you purchase a book from the store. I thought that was pretty neat. Anyway, he gave me a couple of recommendations on which books that are easy enough for me to read and understand (with my limited Korean skills) and was kind enough to answered all of my questions that I asked him in my broken Korean. As a bonus, he even gave me an orange juice before I left. How cool is that? I ended purchasing a short story book written by one of the local musician since it seems like it could be something that I can digest or at least learn something new from. Whether or not I can actually finish reading the whole thing, that's another story tho. I'll let you know. Maybe. Anyways, stay tuned for the second bookstore I visited on this walk. That'll be for the next post.